Robometricschool. - This is one circuit of simple Solar Powered Birdhouse Light using LM317 IC like in Figure 1 below. The major component is used in this circuit is LM317. In here, beside we will give you circuit of Solar Powered Birdhouse Light using LM317 IC, we also will give you component part and description. And the last we will give you link to take read more about this circuit from original source. 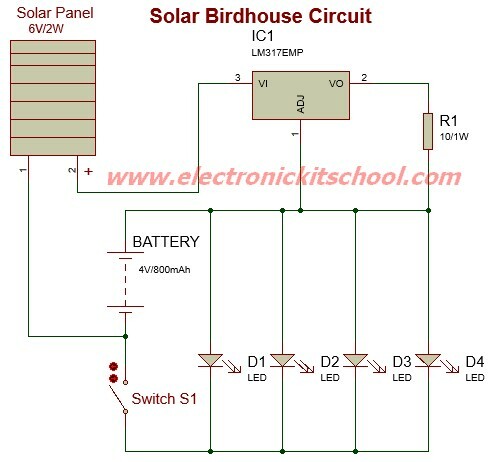 According ElectronicKitSchool site describe that from Electroschematics site that this solar birdhouse light is an economical circuit of a mini solar lighting system circuit is presented here. At the heart of the circuit is a mini 6V/2W solar panel. Here, this solar panel is used to charge a 4V/800mAh rechargeable battery through a charge current limiter circuit built around an adjustable 3-pin regulator LM317T (IC1). And now you can read more about circuit of Solar Powered Birdhouse Light using LM317 IC from original source using link here.